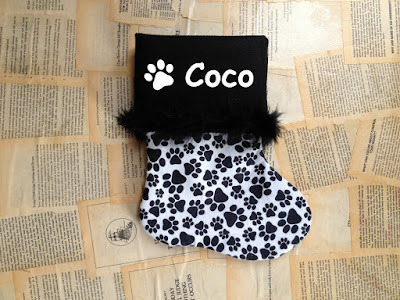 madaboutmint: the best personalized monogram dog Christmas stocking- so stinkin' cute! 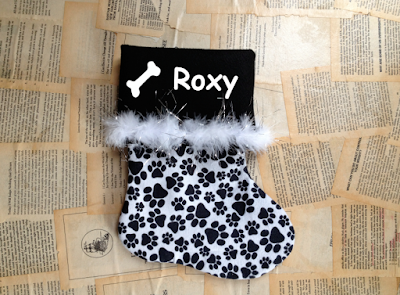 the best personalized monogram dog Christmas stocking- so stinkin' cute! The first year I made Christmas stockings in my Etsy shop I had a gentleman buying a high heel Christmas stocking for his wife (first of all...you have got to give him a hi five for doing that! I am sure his wife did. He bought my sequin high heel Christmas stocking for her. It's this one: high heel Christmas stocking ) He likes his purchase so much that he asked me if I could make Christmas stockings for his 4 dogs. HOW SWEET! I couldn't say no, of course! He wanted small stockings for them and couldn't find any that he liked. He and I together designed 4 black dog stockings for him for his 4 black gods. He loved them AND I I LOVED THE IDEA. That is how these little Christmas stockings for pets were born. For the past couple of years I made them in multiple different color combinations but mostly in this paw print fabric as it turns out darling every time!!! 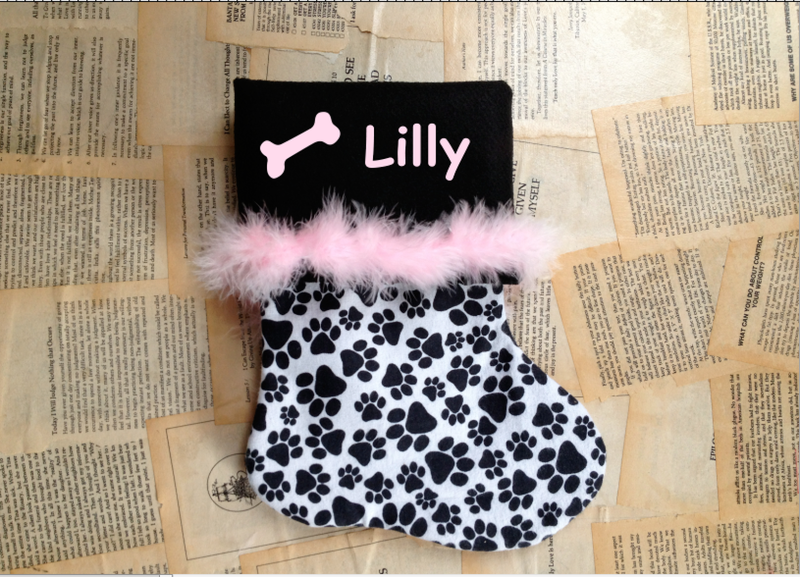 Pink for your small dog with her girlie personality:) So many dog owners can identify with this! 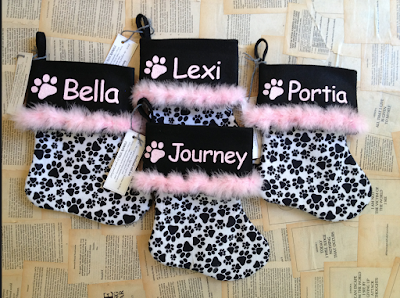 Here is an order with 4 girl doggies. so much cuteness! I just added a different design with a dog bone if you prefer that over the paw print. Matching the color of the name. What dog doesn't love bones?! "So cute!!! My son and his girlfriend love it. Again, surprised by how fast it arrived and the personal contact with Monika. Will definitely shop with Monika again!" "We decided to surprise my 4 year old with a puppy for Christmas,and I thought a stocking would be cute for her to see first. It was late notice and I emailed Monic and she got it done that day and shipped it to me. She made my daughters Christmas more special!! Thank you!!" 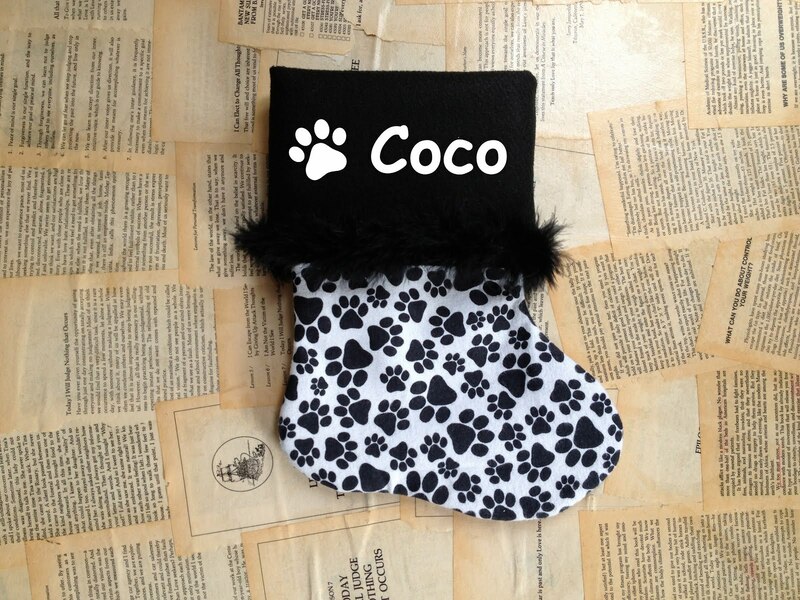 "This stocking was so cute as seen in the picture. It's even nicer in person!!! It's beautiful and nicely made. It's a good size too. I can tell it was made with lots of love. Monika was very responsive to my convos and willing to accommodate my requests. I received my stocking in 2 days!!! 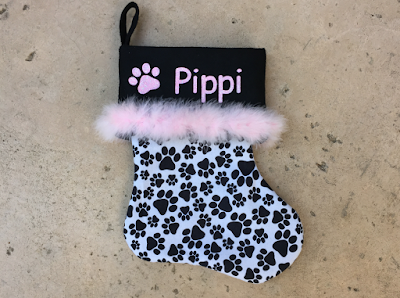 That was awesome since I couldn't wait to receive it to fill it for my furball Princess Nala for her first Christmas :) I will definitely enjoy using this stocking for my pom for many years. :) I couldn't be happier!!! :)"
"Absolutely adorable Christmas stockings!! Great quality!!!" So much cuteness packed in this post. Wow, i mean what a combination of pink and black. 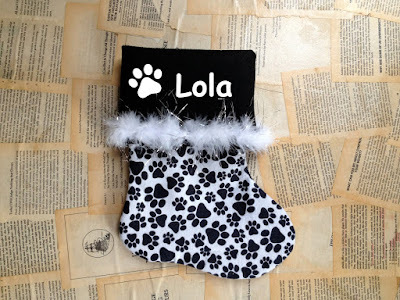 It is really the best personalized monogram dog Christmas stocking i have ever seen on the internet. You are the sweetest, THANK YOU!!!! I really LOVE making these and they always turn out darling!! !